Thank you to Blendtec for generously providing the Designer 725 & Twister Jar for this giveaway! The recipe and opinions in this post are 100% mine. 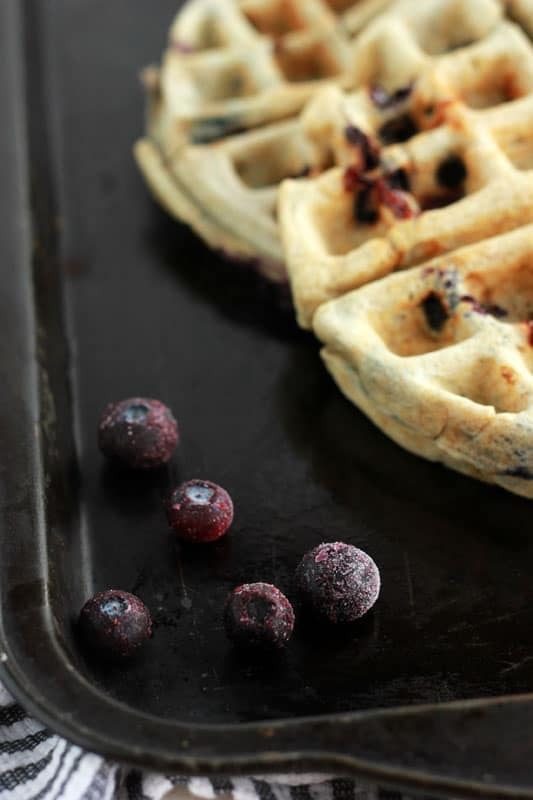 Let’s start our morning with some fresh Blueberry Waffles and a GIVEAWAY! I am so excited for today’s post! 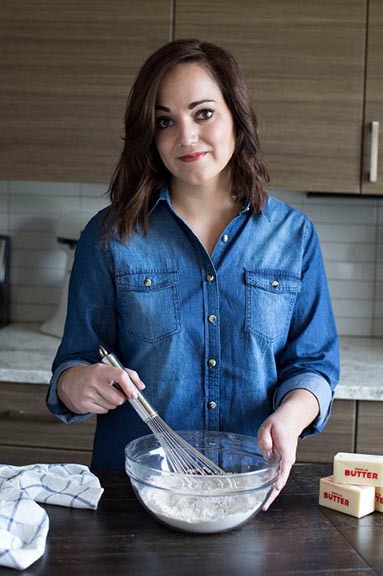 A while back my cute friend Yvonne from Tried and Tasty reached out and asked if I wanted to participate in a fun blogger brunch series. Of course I jumped on the list and was super excited to see all of the participating bloggers. 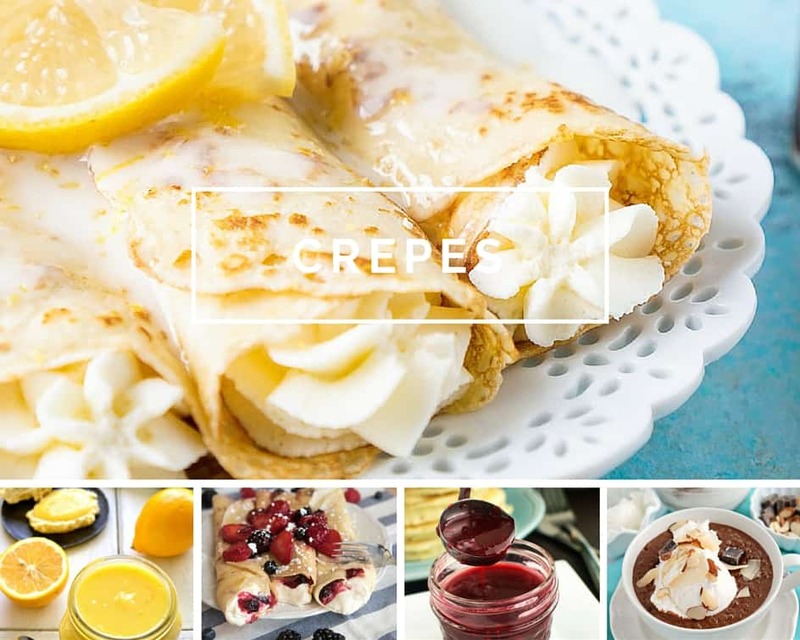 We have a drool worthy list of crepes, waffles, and so much more that you will want to sink your teeth into. 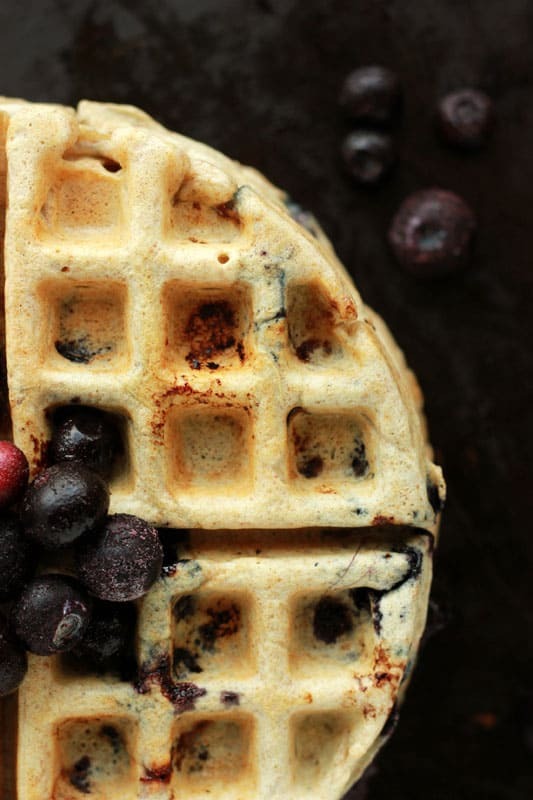 ALL of that is starting with these delicious blueberry waffles. When making waffles I like to think naturally sweet. We are, after all, going to smoother these things with some syrup which means there is no sugar called for in the batter. If you want to sweeten things up you can add a tablespoon or two of granulated without compromising the end results. My six year old gave these two thumbs way up and decided we should always have a bag of these stashed in the freezer for a quick weekday meal. I have to agree and my favorite part about these beauties is the marble affect you get when the berries are smashed under the weight of the iron. It causes a dark purple (or blue?) spiral throughout the waffle that is gorgeous. Top these with a dust of powdered sugar, syrup, or a blueberry sauce and you have got yourself one amazing dish. Turn on your waffle iron and allow to preheat while preparing the batter. Combine the milk, eggs, butter, and vanilla in a measuring cup. Stir until combined and slowly stir into your dry ingredients. Fold in your blueberries. Scoop your batter onto your waffle iron and cook according to the directions. Without further adieu… I bring you the most amazing brunch lovers giveaway! 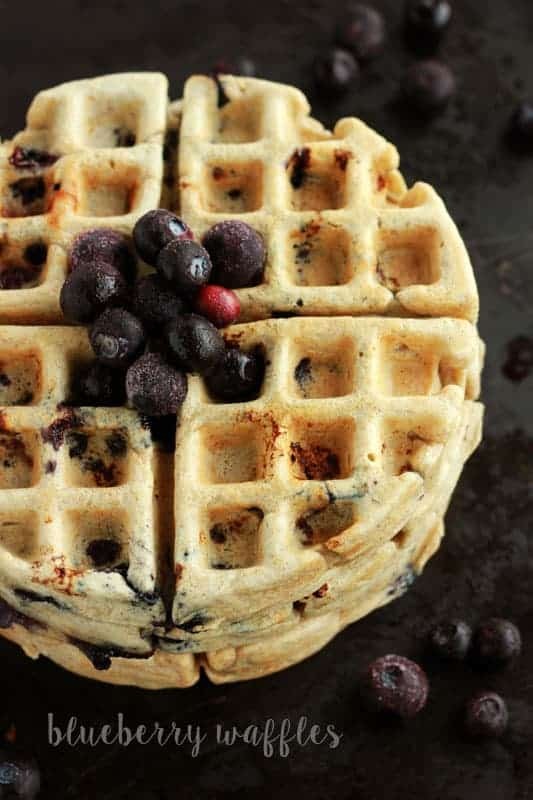 Growing up in Maine, I love blueberries in everything, but I’ve never actually had them in from scratch waffles! I bet they taste a million times better than the Eggo ones I grew up on as a kid, haha! Can’t wait to try this recipe with some native berries this summer! I LOVE blueberry pancakes, why have I never made blueberry waffles?! I love how the waffle iron squishes the blueberries and spreads them more throughout. These look so good! Looks amazing! I love blueberry waffles, but it’s been awhile I think I’m going to have to make some…maybe dinner? 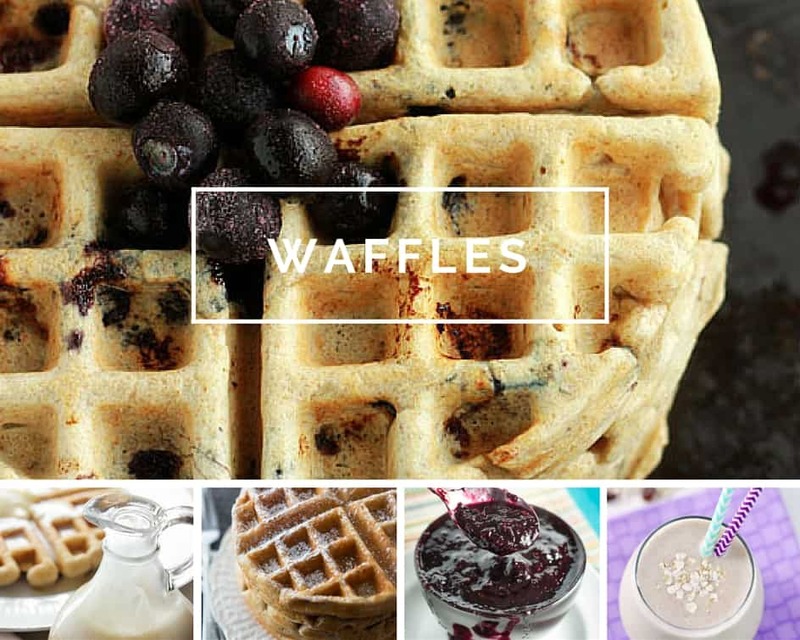 I love blueberry muffins and pancakes, so I know I would love waffles – you’re a genius! Thank you so much for participating in this giveaway with me, I’m so happy to have you!! The only bummer is I wish we could win – how about this prize pack huh?? Amazing!! These waffles look amazing! 🙂 We love anything blueberry in our home, so I know my family would love these. Saving these for the weekend!